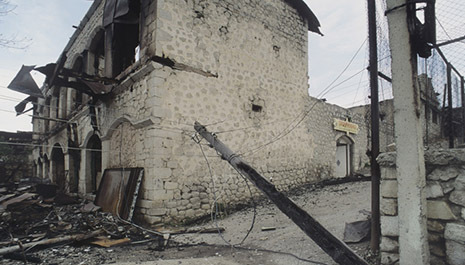 The town of Shusha after Armenian occupation, Karabakh. May 1992. The contemporary Azerbaijani statehood takes its roots back from the Kingdom of Caucasian Albania. The area presently known as Nagorno-Karabakh (Mountainous Karabakh) was a part of that Kingdom since its formation. According to the Antic sources there were 26 tribal unions in Albania, ethnic composition of which was autochthonous Caucasian and Turkic. Albania with its autocephalous church possessed a rich and unique culture, where alphabet in use was composed of 52 letters. In a year 313 A.D. Christianity was confirmed as a state religion in Albania. Turbulent situation did not let it to keep its independence for a long time. In a year 705 A.D. the Kingdom was totally subordinated to the Arab Khalifat. After this, the Khalifat having an alliance with Armenians against Byzantium, with the aim of elimination of the close relations between Albania and Byzantium, subjugated Albanian Church to the Armenian Grigorian Church. Throughout the Middle Ages, Karabakh always was part of the state formations existed in the territory of present Azerbaijan led by Turkic Muslim dynasties and inhabited by Turkic speaking people. 18th century was marked with an establishment of the Karabakh Khanate, which was headed by the Turkic (Azerbaijani) dynasty of Djavanshirs. This was the Azerbaijani Khanate ruled by the hereditary dynastic tradition of Azerbaijani nobles, predominantly populated by ethnic Azerbaijanis. A rule of Russian Empire was imposed on the Khanate after the signature of the Treaty of Kurakchay (1805) between the Khan of Karabakh and the Russian Empire. After the take-over of the overall Caucasian region, the Russian Empire pursued divide et impera policy through different means with a view to establishing and strengthening its total control. Enforced change of demographic situation in the region by massive resettlement of the Armenians to Karabakh from Persia and the Ottoman Empire was an extensive package of measures of such kind. After the Russo-Iranian (1806-1813, 1826-1828) and Russo-Ottoman (1828-1829) wars the ethnic composition of the region was substantially changed. Only during the period of 1828-1830 more than 40.000 Armenians from Persia and 84.600 from Ottoman Empire were settled to Azerbaijan. In 1828, by the order of the Russian Emperor, an Armenian Oblast was formed in the territories of occupied Azerbaijani Khanates (Irevan and Nakhchivan). This was done with the aim of creating a buffer zone in the backyard of the Ottoman Empire and to divide the Turkic speaking band into separate parts. Abolition of the Albanian Church by the Russian Czar in 1836 resulted in ultimate Grigorianization (Armenization) of the Albanian population. May 29 - The government of ADR yielded the town of Irevan (presently Yerevan, the 30% of population were people of different ethnicities, including Armenians, whereas the 70% majority were Azerbaijanis) to the Government of the Republic of Armenia, which had declared its independence, but had no political center. July 5 - The Caucasian Bureau of the Central Committee of the Communist Party of Russia (bolshevik) decided: "Proceeding from the necessity to maintain peace between Moslems and Armenians, economic ties between Highland and Lowland Karabakh, its uninterrupted ties with Azerbaijan, to keep Mountainous Karabakh within the Azerbaijan SSR and to grant broad regional autonomy." July 7 - Decree of the Central Executive Committee of the Communist Party of Azerbaijan SSR on "Formation of the Autonomous Region in the Mountainous Karabakh with an administrative center in Khankendi" (The name of the town was renamed from Khankendi to Stepanakert after Stepan Shaumian, famous bolshevik leader, in September 1923). At the same time, three hundred thousands of Azerbaijanis who have lived in compact settlements in Armenia were refused even cultural autonomy by the governments of both the USSR and the Armenian SSR. August 18 - The statement of the President of the UN Security Council on full, immediate and unconditional withdrawal of the occupying forces from the Agdam district and other recently occupied districts of Azerbaijan. Negotiations on elaboration of the agreement on cessation of the conflict. iv. right of return of refugees and displaced persons and their reintegration respecting human rights. L. Ter-Petrosian noted the importance of the step-by-step resolution of the conflict in his article "War or Peace". Later, he had to resign under the pressure of the political-military circles. The Prime Minister R. Kocharyan (a resident of the Mountainous Karabakh region of Azerbaijan and leader of separatists until before this appointment) became an acting President of the country. Short after his victory in the presidential elections, the position of Armenia on the settlement of the conflict became tougher. Between 1997-2002, no meeting of the OSCE Minsk Group was held in full composition. Direct talks between the Presidents of Azerbaijan and Armenia. Up to date, they have met more than 20 times. No results have been achieved so far. August 2 - The EU condemned holding of the so-called "presidential elections" in Nagorno-Karabakh region of the Republic of Azerbaijan. January 23 - An Enlarged Bureau of the Council of Europe Committee of Ministers held a special session in Strasburg on the fulfillment of the obligations undertaken by Azerbaijan and Armenia to peacefully settle the Armenia-Azerbaijan conflict. January 30 - The Secretary General of the Council of Europe voiced regret at the recent declaration on "ethnic incompatibility between Armenians and Azerbaijanis", made by President Kocharian of Armenia. "Recalling dark pages of European history will never be a good electoral strategy", underlined Walter Schwimmer in reference to the upcoming presidential elections in Armenia, scheduled for 19 February. February 19 - March 5 The presidential elections in Armenia. first round - second round R. Kocharyan was elected as the president of the Republic of Armenia for his second term. The observers of OSCE/ODIHR, CE Parliamentary Assembly reported that the elections were held with serious irregularities. June 19 - The coalition government of Armenia submitted its action plan for the next four years to the parliament. The section "Defense and Security" of this program states that, "as in previous years, the government sees the resolution of the Nagorno-Karabakh problem within peace negotiation process, emphasizing international recognition of the right of the "Artsakh" (Nagorno-Karabakh) people to self-determination and security guarantees of the population of the "Nagorno-Karabakh Republic". The very possibility of subordination of the "Nagorno-Karabakh Republic" to Azerbaijan is ruled out." During the presentation of the program, the Armenian Prime Minister A.Markaryan, speaking about the Armenia-Azerbaijan conflict, said: "Karabakh must not be part of Azerbaijan, must have a common border with Armenia and that the self-determination of the Karabakh Armenians must be recognized by the world". August 19 - During monitoring held by the Office of Personal Representative of the OSCE Chairman-in-Office on the Armenia-Azerbaijan border in the Tovuz region of Azerbaijan the Armenian side again broke ceasefire regime, as a result of which the monitoring process was immediately stopped. Unfortunately, the Personal Representative of the OSCE Chairman-in-Office Andrzej Kasprczyk refused to mention this fact in his information report. September - Co-chairmen of the OSCE Minsk Group from Russia N.Gribkov was replaced by Y.Merzlyakov. During his visit to the region he held series of meetings with Azerbaijani officials on September 3-5. October 15 - The presidential elections in Azerbaijan. Ilham Aliyev was elected as the president of the Republic of Azerbaijan for his first term. December 11 - The first meeting of the President of Azerbaijan Mr. I.Aliyev with his Armenian counterpart in Geneva. April 16 - The meeting of the Foreign Ministers of Armenia and Azerbaijan with participation of the OSCE Minsk Group Cochairmen in Prague. April 28-30 - The meeting of the Presidents of Azerbaijan and Armenia in Warsaw. May 12-13 - The meeting of the Foreign Ministers of Armenia and Azerbaijan with participation of the OSCE Minsk Group Cochairmen in Strasbourg. June 21 - The meeting of the Foreign Ministers of Armenia and Azerbaijan with participation of the OSCE Minsk Group Cochairmen in Prague. August 3-12 - Command staff exercises conducted by Armenian armed forces in the occupied territories of the Republic of Azerbaijan. August 8 - "elections" to the "local self-government bodies" were held by the authorities of the Armenian separatist regime in the occupied territories of Azerbaijan. In the statement of the Ministry of Foreign Affairs of Azerbaijan it was noted that such kind of "elections" may not pretend to have a single piece of legitimacy because they are in complete contradiction with the norms of international law, as well as with the national legislation of the Republic of Azerbaijan, since they are being held in conditions of continuing aggression, occupation and forceful expulsion of one third of the indigenous population of the Nagorno-Karabakh region of the Azerbaijani origin. August 30 - The meeting of the Foreign Ministers of Armenia and Azerbaijan with participation of the OSCE Minsk Group Cochairmen in Prague. September 15 - The meeting of the Presidents of Armenia and Azerbaijan within the CIS Summit in Astana. The President of Armenia Robert Kocharian requested to delay the following Prague meeting (25th of October 2004) of the Foreign Ministers of Azerbaijan and Armenia for need to analyze and comprehend the results of the previous four meetings of FMs. October 14 - Azerbaijan requested the inclusion of an additional item in the agenda of the fifty-ninth session of the UN General Assembly, entitled "The situation in the occupied territories of Azerbaijan". October 29 - Acting on the recommendations of its General Committee, the UN General Assembly decided to include an additional item on its current agenda entitled "The situation in the occupied territories of Azerbaijan". It took that decision by a recorded vote of 43 in favour to 1 against (Armenia) with 99 abstentions. November 19 - The meeting of the Foreign Ministers of Armenia and Azerbaijan in Berlin. November 23 - Additional item #163 "The situation in the occupied territories of Azerbaijan" was debated on the 59th session of UN General Assembly. The Minister of Foreign Affairs of Azerbaijan gave a speech concerning the content of the additional item and illegal activities of Armenia in the occupied territories of Azerbaijan. December 5 - The meeting of the Foreign Ministers of Armenia and Azerbaijan with participation of the OSCE Minsk Group Cochairmen in Sofia. December 6-7 - The meeting of the 12th OSCE Ministerial Council in Sofia. The adoption of the Ministerial Council statement on the Nagorno-Karabakh conflict, which "commend the progress achieved in the settlement of the Nagorno-Karabakh conflict in 2004, in particular, the three meetings of the Presidents of Armenia and Azerbaijan under the auspices of the Co-Chairmen of the OSCE Minsk Group and welcome the creation of the so-called "Prague Process", through which four meetings between the Foreign Ministers of both countries allowed the methodical re-examination of all the parameters of a future settlement". December 9 - The meeting of the Foreign Ministers of Armenia and Azerbaijan in Brussels in the framework of NATO EAPC Ministerial. January 11 - The meeting of the Foreign Ministers of Armenia and Azerbaijan with participation of the OSCE Minsk Group Co-Chairmen in Prague. January 25 - Parliamentary Assembly of the Council of Europe (PACE) adopted a resolution 1416. The resolution reaffirms "that independence and secession of a regional territory from a state may only be achieved through a lawful and peaceful process based on democratic support by the inhabitants of such territory and not in the wake of an armed conflict leading to ethnic expulsion and the de facto annexation of such territory to another state." The Assembly calls on Armenia and Azerbaijan to make use OSCE Minsk Process and actively submit to each other via the Minsk Group their constructive proposals for the peaceful settlement of the conflict. David Atkinson, special PACE Rapporteur on Nagorno-Karabakh, the author of the resolution and recommendations, responding to the question of the BBC correspondent on the principle of territorial integrity vs. the principle of self-determination in resolution of the conflict, stated that principle of self-determination can not be applied to the case of Nagorno-Karabakh, because Azerbaijan stands for its territorial integrity, recognized by international community. January 30 - February 5 - The visit by the "OSCE Minsk Group Fact-Finding Mission on Settlements in the Occupied Territories of Azerbaijan" to the occupied territories - Aghdam, Jabrayil, Fizuli, Zangilan, Gubadly, Kalbajar and Lachin - of Azerbaijan. February - The OSCE dispatch Fact-Finding Mission to investigate the Armenian illegal settlements in the occupied Azerbaijani territories. March 2 - The meeting of the Foreign Minister of Azerbaijan with the OSCE Minsk Group Co-chairs in Prague. The OSCE Minsk Group Co-Chairs officially presented a report of the OSCE Minsk Group Fact-Finding Mission (FFM). In their joint statement Co-Chairs pointed that "the mission found evidence of the presence of settlers in the territories examined" and recommended "that any further settlement of the occupied territories of Azerbaijan should be discouraged". They urged "the parties to accelerate negotiations toward a political settlement in order, inter alia, to address the problem of the settlers and to avoid changes in the demographic structure of the region, which would make more difficult any future efforts to achieve a negotiated settlement". In his comments Minister of Foreign Affairs of Azerbaijan Elmar Mammedyarov considered the FFM report as objective in general. The FFM determined about 16,000 settlers in the occupied territories of Azerbaijan outside the Nagorno-Karabakh region. "It is clear that the longer they remain in the occupied territories, the deeper their roots and attachments to their present places of residence will become. Prolonged continuation of this situation could lead to a fait accompli that would seriously complicate the peace process" said Co-Chairs` statement. April 15 - Continuation of "Prague process" in London. Foreign Minister of Azerbaijan and Armenia met separately with the Co-chairs of the OSCE Minsk Group to discuss further steps to resolve the conflict. The mediators - France, Russia and the US declared that the peace process has entered a "sensitive juncture, where a first step towards an agreement could be at hand in the framework of the discussions between the parties." April 27 - The meeting of the Foreign Minister of Azerbaijan with the OSCE Minsk Group Co-chairs in Frankfurt. In the threshold of the Council of Europe`s Summit in Warsaw Presidents Ilham Aliyev of Azerbaijan and Robert Kocharyan of Armenia met at the Belvedere palace in the presence of the OSCE Minsk group Co-chairs, and Foreign Ministers Sergey Lavrov of Russia and Michel Barnier of France. Minister of Foreign Affairs of Azerbaijan Elmar Mammadyarov has briefed journalists on the three-hour meeting. "Despite certain progress has been reached, there is still a need for further discussion," he said. The Minister added that after the meeting the Presidents have assigned the Foreign Ministers of Azerbaijan and Armenia to continue negotiating some important issues other than those agreed within the Prague process. According to him, the Co-chairs will also continue their activities. "Generally, no format of the talks but their result is important for Azerbaijan, in other words, territorial integrity of Azerbaijan must be restored," the Minister said. June 17 - The meeting of the Foreign Ministers of Armenia and Azerbaijan with participation of the OSCE Minsk Group Co-chairs in Paris. June 19 - "Elections" to the "parliament" were held by the authorities of the Armenian separatist regime in the occupied territories of Azerbaijan. In its statement, the Ministry of Foreign Affairs of Azerbaijan noted that such kind of "elections" may not pretend to have a single piece of legitimacy because they are in complete contradiction with the norms of international law, as well as with the national legislation of the Republic of Azerbaijan, since they are being held in conditions of continuing aggression, occupation and ethnic cleansing. It states that such activities by Armenian side do not fit with the spirit of negotiation process, esp. when there is a hope for positive step forwards and that continuous peace cannot be achieved without normalization of life and peaceful co-existence and cooperation of Azerbaijani and Armenian communities of Nagorno-Karabakh region of the Republic of Azerbaijan. July 5 - The OSCE Parliamentary Assembly considered a report on the Armenia-Azerbaijan conflict at its session held in Washington. The report prepared by the Assembly`s special envoy on the conflict Goran Lennmarker from Sweden. In his comments Mr. Lennmarker stressed that "the conflict is not frozen. Several people are killed along the line-of-contact every year". He added: "there is no alternative to a peaceful solution - in fact there is an urgent need to solve the conflict in order to end the personal, economic, and social suffering on both sides of this conflict". Mr. Lennmarker suggested basing a solution on experiences from Europe, where democracy and integration are fundamental components in securing a lasting peace. The report points out the fundamentals of ending of occupation, the return of refugees and IDPs as well as democracy and minority rights. Swedish diplomat recommends autonomy solution referring to an example of the Aland islands. July 10-12 - The OSCE Group Co-Chairs (Ambassadors Steven Mann of the U.S., Yuriy Merzlyakov of Russia and Bernard Fassier of France) visited Azerbaijan and Armenia. In Azerbaijan they met with President Ilham Aliyev and Foreign Minister Elmar Mammadyarov as well as with Nizami Bakhmanov, the head of the expelled Azerbaijani community from the occupied Nagorno-Karabakh region of Azerbaijan. The Co-chairs told journalists at a press conference on July 12 that they discussed with President and Foreign Minister the principles, which could have become a basis for the future peace treaty. Mediators pointed out that much would depend on the two leaderships` political will and the peoples` desire. During the meetings Co-Chairs discussed, among other issues, an Azerbaijani initiative to open a road network Agdam-Khankendi-Shusha-Lachin-Goris-Nakhichevan which would open communication line from Azerbaijan to Armenia and Nakhichevan enclave of Azerbaijan as well as Turkey. Nizami Bkhamanov positively responded to an idea of launching a dialogue between Azerbaijani and Armenian communities of the Nagorno-Karabakh region of Azerbaijan. Deputy Foreign Minister of Azerbaijan Araz Azimov commented Co-Chairs` meetings in Baku as "effective and fruitful." But he said that "negotiations were rather difficult and complicated." "I can`t say that agreements have been reached. At all the meetings Azerbaijan has demonstrated a constructive position. Armenia also should occupy a constructive position, otherwise all opportunities will be missed," said Azimov. Azimov pointed out that Armenia tries to bring "new elements," which are not subject of the negotiations. "There are great chances to achieve peace right now and the opposing party can lose them. I urge Armenia to use this chance," said Azimov. "Azerbaijani occupied territories must be given back. Armenia must not claim to Azerbaijani territories under the pretext of the corridor (linking Armenia with Nagorno-Karabakh region of Azerbaijan). Armenia can use the road passing through the Lachin corridor. But Lachin city cannot remain under occupation." Opening of Agdam-Khankendi-Shusha-Lachin-Goris-Nakhichevan road will help to improve relationships and restore cooperation and confidence between people, said Azimov. He also stressed that the status of the Nagorno-Karabakh region could be resolved only through joint efforts of Armenian and Azerbaijani communities of Nagorno-Karabakh. "At present, part of people living in Nagorno Karabakh is Armenians, who arrived from abroad. Local Armenians are Azerbaijani citizens and Azerbaijanis must determine their status by themselves. For this purpose Azerbaijani population must return to the liberated territories and economic relationships and mutual confidence must be restored," said Azimov. August 12 - In its Address to the voters, the Central Election Commission of the Republic of Azerbaijan notified of the start of functioning of Khankendi Constituency No. 122 and called all citizens of Azerbaijan of Armenian origin living in Khankendi, Shusha, Khojali, Khojavend and other settlements of Nagorno Karabakh regions of the Republic of Azerbaijan, together with their countrymen to exercise their voting rights in Khankendi Constituency No. 122 and Shusha-Fuzuli-Khojali-Khojavend Constituency No. 124. August 24 - The meeting of the Foreign Ministers of Armenia and Azerbaijan with participation of the OSCE Minsk Group Co-chairs in Moscow. August 26-27 - The meeting of the Presidents of Armenia and Azerbaijan within the CIS Summit in Kazan. September 12 - The item entitled "The situation on the occupied territories of the Republic of Azerbaijan" was included into the agenda of the 60-th session of the UN General Assembly. On the same day the Parliamentary Assembly of the Council of Europe held discussion on the Armenia-Azerbaijan conflict in Paris. The PACE decided to follow further the process of honouring by two sides the decisions contained in the January 2005 PACE resolution on the conflict settlement. September 14 - An international organization - International Crisis Group (ICG) working to prevent conflicts worldwide has issued report on Armenia-Azerbaijani conflict. ICG vice-president Alain Deletroz told at news conference in Baku that Armenia should not insist on the determination of the status of the Nagorno-Karabakh region of Azerbaijan, as disputes over the issue have considerably delayed the conflict resolution. "Armenia must withdraw from seven occupied Azerbaijani districts, refugees should return home, trust be restored between the two sides, and at last, the Karabakh status determined." Deletroz said that the activities to be carried out prior to the status determination will take at least 15-20 years. Deletroz said that just like all other international organizations, the ICG considers the Nagorno-Karabakh a part of Azerbaijan. "This is the legal aspect of the issue and there is no problem with it. The problem is that the Nagorno-Karabakh is de-facto in the hands of Armenians." The ICG project director on South Caucasus Sabin Frasier said the organization has welcomed the resumption of activity of the Khankandi district constituency in the Nagorno-Karabakh, which will allow ethnic Armenian citizens of Azerbaijan to vote in the November parliament elections in Azerbaijan. December 5 - The meeting of the Foreign Ministers of Armenia and Azerbaijan with participation of the OSCE Minsk Group Co-chairs in Ljubljana within the framework of the OSCE Ministerial Council meeting. December 5-6 - The meeting of the 13th OSCE Ministerial Council in Ljubljana. The adoption of the Ministerial Council statement on the conflict dealt with by the OSCE Minsk Group, which "takes note with satisfaction of the progress in the Nagorno-Karabakh negotiations through the "Prague Process" in 2005, and in particular the two meetings of the Presidents of Armenia and Azerbaijan in Warsaw and Kazan under the auspices of the Co-Chairs of the OSCE Minsk Group, and encourages the Presidents of Armenia and Azerbaijan to use the current promising window of opportunity in order to attain within the coming year significant achievements in the settlement of the conflict in the framework of the OSCE Minsk process." December 16 - The visit of the OSCE Minsk Group Co-Chairs to Azerbaijan. December 16-20 - The reconnaissance trip of the High-Level Planning Group (HLPG) of the OSCE to Azerbaijan. January 18-19 - The meeting of the Foreign Ministers of Armenia and Azerbaijan with participation of the OSCE Minsk Group Co-chairs in London. January 20-27 - The reconnaissance trip of the High-Level Planning Group (HLPG) of the OSCE to the occupied territories of Azerbaijan. February 1 - The visit of the OSCE Minsk Group Co-Chairs to Azerbaijan. Firstly, in the period when independent Azerbaijan became part of the Soviet Union Karabakh had not been within its jurisdiction, the evidence of which was the decision of the League of Nations that refused to recognize Azerbaijan because of its territorial claims to the Armenian populated Eastern Caucasus, including in particular Nagorny Karabakh, as well as the lack of efficient state control over its supposed territory and inability to ground the legitimacy of the frontiers of this territory. Secondly, the legal cause for secession of Nagorny Karabakh from Azerbaijan in the process of disintegration of the USSR in 1991 and the establishment of the "Republic of Nagorny Karabakh". Thereby the special emphasis is placed on the provisions of the Law of the USSR "On the Procedures for Resolving Questions Related to the Secession of Union Republics from the USSR" of 3 April 1990, according to which in case of realization by the Union republic of the secession procedure provided for in this Law autonomous entities would acquire a right to decide independently the question of staying in the USSR or in the seceding republic, as well as to raise the question of their own state-legal status. Thirdly, refusal by Azerbaijan to regard itself as a successor state to the USSR, and thus the lack of any reason to have pretensions to the frontiers of that period(2). In 1918-1920 the Republic of Azerbaijan had diplomatic relations with a number of states. Agreements on the principles of mutual relations were signed with some of them; sixteen states established their missions in Baku. On 12 January 1920 at the Paris Peace Conference the Supreme Council of the Allied Powers de-facto recognized the independence of the Republic of Azerbaijan. The head of the Azerbaijani Delegation at the Conference by a letter of 1 November 1920 requested the Secretary-General of the League of Nations to submit to the Assembly of the League an application for the admission of the Republic of Azerbaijan to the Organization. The relevant documents of the League of Nations completely disprove the statements of the Armenian side claiming that the League of Nations did not admit Azerbaijan because of its alleged territorial claims to the so-called Armenian-populated territories and the refusal to recognize the control of Azerbaijan over Nagorny Karabakh. It is obvious actually that the state, considerable part of the territory of which was occupied by the time of consideration of its application in the League of Nations, and yet the Government that submitted this application was overthrown, could not be regarded as fully self-governing in terms of Article 1 of the Covenant of the League of Nations. Thus, these were just those conditions that prevented Azerbaijan from being admitted to the League of Nations. Transcaucasian Socialist Federal Soviet Republic (TSFSR) was established on 13 December 1922. The Constitution of the TSFSR confirmed that the Republic of Nakhichevan was an inseparable and constituent part of Azerbaijan in form of an autonomous unit. According to this Constitution, the status of autonomous republics and oblasts (Abkhazia, Ajaristan and South Ossetia) remained unchangeable. The next day after the adoption on 7 July 1923 of the first Constitution of the USSR, the Central Executive Committee of the Azerbaijan SSR issued a Decree "On the Formation of the Autonomous Oblast of Nagorny Karabakh". Under Article 78 of the USSR Constitution, the territory of a Union republic could not be altered without its consent. The borders between Union republics could be altered by mutual agreement of the Republics concerned, subject to approval by the USSR. (12) This provision was also incorporated in the Constitutions of the Azerbaijan SSR and the Armenia SSR. Thus, the whole process of separation of Nagorny Karabakh from the Azerbaijan SSR in favor of the Armenia SSR, formally started on 20 February 1988, was accompanied by the apparent violation of the USSR Constitution, and, therefore, caused no legal consequences whatsoever. It is necessary first to note that the purpose of this Law was to regulate mutual relations within the framework of the USSR by establishing a specific procedure to be followed by Union republics in the event of their secession from the USSR. A decision by a Union republic to secede had to be based on the will of the people of the Republic freely expressed through a referendum, subject to authorization by the Supreme Soviet of the Union republic. At the same time, according to this Law, in a Union republic containing autonomous republics, autonomous provinces and autonomous regions, the referendum had to be held separately in each autonomous unit, the people of which retained the right to decide independently the question of staying in the USSR or in the seceding Union republic, as well as to raise the question of their own state-legal status. It is important to emphasize that the secession of a Union republic from the USSR could be regarded valid only after the fulfillment of complicated and multi-staged procedure and, finally, the adoption of the relevant decision by the Congress of the USSR People`s Deputies. However, until the Soviet Union ceased to exist as international person the mentioned Law was without legal effect, since no Union republic, including Azerbaijan and Armenia, had used the procedure for secession stipulated in it. Until the Republic of Azerbaijan attained full independence and was recognized by the international community, the territory, on which the NKAO of the Azerbaijan SSR existed before 26 November 1991, had remained part of Azerbaijan. After the collapse of the USSR, the international legal doctrine of uti possidetis juris underlay the international, regional and national legitimation of boundaries of the newly independent states. 1. Despite the apparent distortions made by the official Yerevan while interpreting the issue of consideration of the application by Azerbaijan for the admission to the League of Nations and passing over in silence the response of the League to the similar application by Armenia itself, the findings of this Organization cannot, nevertheless, serve as a basis for revision of the established territorial framework of the states. Otherwise, if to agree with the arguments of the Armenian side, then the international legal personality of Armenia will be prejudiced. 2. In accordance with the Constitution of the USSR, Nagorny Karabakh was an autonomous oblast within the Azerbaijan SSR. Pursuant to the Constitutions of the USSR and the Azerbaijan SSR, the legal status of the NKAO was governed by the Law "On the Nagorny Karabakh Autonomous Oblast" passed by the Supreme Soviet of the Azerbaijan SSR on 16 June 1981. 3. The proclamation on 2 September 1991 of the "Republic of Nagorny Karabakh" contradicted the Constitution of the USSR, according to which the territory of a Union republic could not be altered without its consent, while the borders between Union republics could be altered by mutual agreement of the Republics concerned, subject to approval by the USSR. At the same time, reference to the Law of the USSR "On the Procedures for Resolving Questions Related to the Secession of Union Republics from the USSR" of 3 April 1990 is groundless since the obligatory mechanism envisaged therein for drawing up the secession from the USSR was used by Azerbaijan neither before nor after 2 September 1991. 4. Autonomous oblast existed until 26 November 1991, when the Supreme Soviet of the Republic of Azerbaijan adopted the Law on its abolition. 5. In accordance with the doctrine of uti possidetis juris, from the time of attainment by the Republic of Azerbaijan of its independence the former administrative borders of the Azerbaijan SSR, which included also the NKAO, are recognized as international and protected by international law. At the same time, it is important to note that the change of sovereignty as a result of the break up of the USSR and the state succession declared by the former Union republics were powerless to undermine their boundaries which achieved permanence. *Tofig F. Musayev, LLM in International Human Rights Law, University of Essex. Tadeusz Swietochowski. Russia and Azerbaijan: A Borderland in Transition (New-York: Columbia University Press, 1995), pp. 75-76. League of Nations. Memorandum by the Secretary General on the Application for the Admission of the Republic of Azerbaijan to the League of Nations. Assembly Document 20/48/108, p.2 See also The Covenant of the League of Nations (1919), in Malcolm D.Edvans (ed. ), Blackstone`s International Law Documents (Oxford: Oxford University Press, 6th ed., 2003), pp. 1-7, at p. 1, Article 1. League of Nations. Assembly Document 20/48/108, p. 4. League of Nations. Annex 30 B. Future status of Armenia. Memorandum agreed to by the Council of the League of Nations, meeting in Paris on 11 April 1920. League of Nations Document 20/41/9, p. 27; See also Admission of new Members to the League of Nations. Armenia. Assembly Document 209, pp. 2-3; Assembly 251. Extract from the Protocol of the plenary session of the Caucasian Bureau of the Central Committee of the Russian Communist Party (Bolsheviks) of 5 July 1921. For text see "To the history of formation of the Nagorny Karabakh Autonomous Oblast of the Azerbaijan SSR.. 1918-1925: Documents and Materials" (Baku: Azerneshr, 1989), p. 92. Treaty of Friendship between Armenia SSR, Azerbaijan SSR, Georgia SSR, on the one hand, and Turkey-on the other, concluded with the participation of the RSFSR in Kars, on 13 October 1921. Documents of foreign policy of the USSR, volume IV (Moscow: Gospolitizdat, 1960), p. 423, Article 5. First Congress of Transcaucasian Soviets. Zakraykom RKP edition (Tiflis: Military Commissariat Press, 1923) p. 144. Constitution of the USSR (Moscow, 1936), p.14, Article 24; Constitution of the USSR (Moscow, 1977), pp. 13-14, Article 87. Law of the Azerbaijan SSR "On the Nagorny Karabakh Autonomous Oblast", 16 June 1981 (Baku: Azerneshr, 1987), p. 3, Article 3. Constitution of the USSR (Moscow, 1977), p. 13. Resolution of the Presidium of the Supreme Soviet of the USSR "On measures concerned with the appeals of the Union republics regarding the events in Nagorny Karabakh, in the Azerbaijan SSR and the Armenia SSR", 23 March 1988. Bulletin of the Supreme Soviet of the USSR, 1988, № 13, pp. 27-28; Resolution of the Supreme Soviet of the USSR "On the decisions of the Supreme Soviets of the Armenia SSR and the Azerbaijan SSR on the question of Nagorny Karabakh", 18 July 1988. Bulletin of the Supreme Soviet of the USSR, 1988, № 29, pp. 20-21; Resolution of the Presidium of the Supreme Soviet of the USSR "On inconsistency with the Constitution of the USSR of the acts on Nagorny Karabakh adopted by the Supreme Soviet of Armenia SSR on 1 December 1989 and 9 January 1990 ". Bulletin of the Supreme Soviet of the USSR, 1990, № 3, p. 38. Law of the USSR "On the Procedures for Resolving Questions Related to the Secession of Union Republics from the USSR", 3 April 1990. Bulletin of the Soviet of the USSR, 1990, №15, pp. 303-308. Vienna Convention on Succession of States in Respect of Treaties, 22 August 1978. For text see Evans (ed. ), pp. 185-199, at p. 188. Malcolm N. Shaw, "The Heritage of States: The Principle of Uti Possidetis Juris Today", 77 The British Yearbook of International Law 1996 (Oxford: Clarendon Press, 1977), pp. 75-154, at p. 90.